MATHiaU is here to solve your Developmental Math problem. A better solution for college developmental math. The stakes are high. Remedial courses for incoming college students total $6.7 billion a year, yet the average success rate for remedial math courses is just 33%. We need a different solution if we hope to get better results. MATHiaU was intentionally designed by Carnegie Learning's team of cognitive and learning scientists with one goal: delivering a better, more efficient learning experience to every Developmental Math student. It's smarter, more nimble, more affordable – and proven to work. MATHiaU takes math beyond memorizing and performing. It coaches students until they learn the math. Unit overviews provide “Why This Matters” videos to connect the math to the real world. Step-by-step examples then guide students through each step of a sample problem, describing the steps as a teacher might in the classroom. Then, like a human coach, MATHiaU re-phrases questions, re-directs the student, and hones in on the parts of the problem that are proving most difficult. MATHiaU looks at every aspect of the student’s work to better understand what they’re thinking. MATHiaU combines expertise from master math practitioners and cognitive scientists, ensuring that each workspace delivers the best possible learning. MATHiaU integrates seamlessly with any Learning Management System (LMS), providing a single easy-to-use learning experience for instructors. And with a simple, modern design, MATHiaU “just works” wherever your students are, from desktop, to laptop, to tablet. 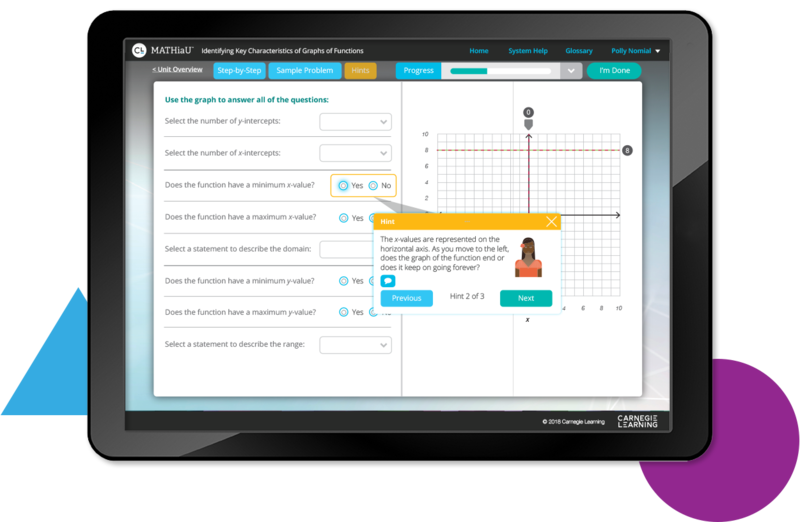 We’ve also partnered with OpenStax, a leading provider of open educational resources, to combine MATHiaU with OpenStax textbooks into a single, affordable learning solution for developmental math. The most powerful math learning in higher education has never been available for such a low price. Proven to work like no other. 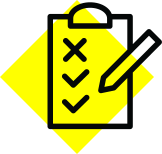 Hints and Just-In-Time Feedback are delivered to each student based not only on what they know, but also on the specific strategy they're using to solve a given problem. Every keystroke is continuously analyzed, so you can see each individual student's progress towards mastering each discrete skill. Knowing that a student sometimes struggles solving linear equations is good. Knowing that the student is struggling when the coefficient is -1 is better, so you can address knowledge gaps and provide guidance in real time. MATHiaU empowers students to take ownership of their learning by giving them real-time updates on their progress. The Progress Bar motivates and empowers students by visually displaying their progress toward multiple skills. As they become more proficient in each skill, the bars increase and change color. Students gain confidence from seeing their progress, while instructors are able to identify and respond to specific student needs. MATHiaU is the only program that provides clear, deep insight into where students are going, not just where they currently are. 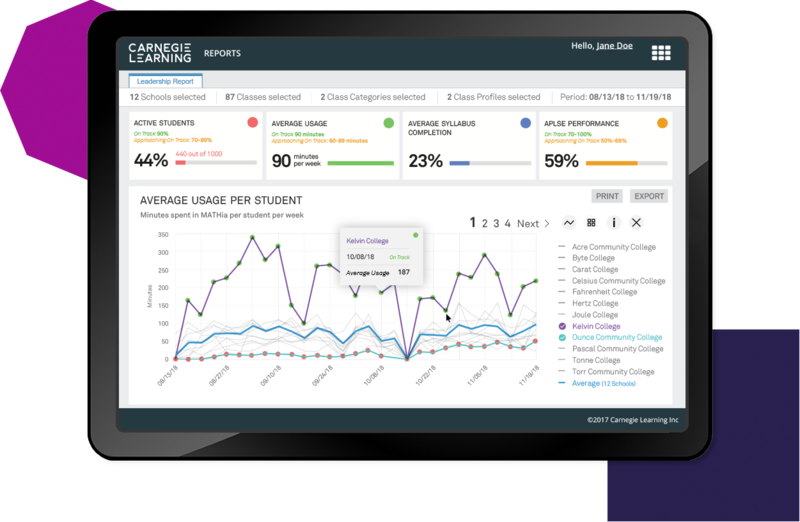 The Adaptive Personalized Learning Score (APLSE) Report leverages predictive analysis to give instructors a clear projection of where students are heading in their progress to mastery, so that instructors can intervene and get them the help that they need before it's too late. MATHiaU takes the guesswork out of interpreting student and group data, and clearly shows how your investment is impacting your students and classes as a whole. The Leadership Dashboard provides continual insight on student, class, and institutional progress toward learning goals. 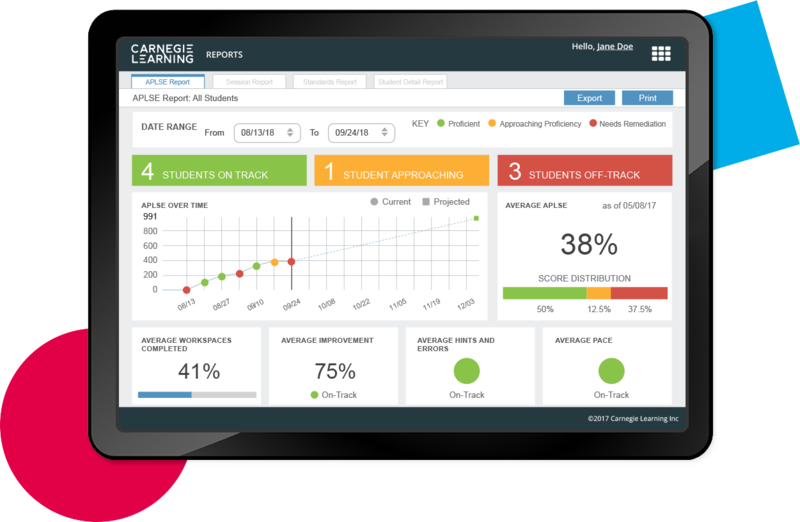 Additional reports measure progress towards mastery and key performance details, such as rate of module completion, time spent, average errors per problem and more. LiveLab is Carnegie Learning’s new live facilitation tool, currently in limited beta release. It empowers teachers with in-the-moment, actionable data to effectively manage students working in MATHia during a classroom lab. Dynamic indicators show which students are working or idle at all times, while alerts let teachers know which students may need additional support. Teachers can also get live notifications to help them assist students who are having trouble mastering specific skills or completing certain activities, or to recognize students for hitting content progression milestones. Designed for Developmental Math Success. MATHiaU supports any Developmental Math course, offering an engaging 1-to-1 coaching experience that helps students deepen their understanding of math concepts and grow their core skills. Complete this form to experience MATHiaU hands on. Thank you. We'll be in touch shortly with more information. Let’s work together to put better math learning within reach for your Developmental Math students.